You’ve excelled at staying on track while dining at Mexican Restaurants and Italian feasts, now it’s time to master your sushi cravings. Adee and Michael are taking you along to find success at a sushi restaurant, including tips for substitutions, words to avoid on the menu and how to handpick a roll that caters specific macro needs! When it comes to starters, keep it simple. The appetizer section will most likely include spring rolls and a range of things with the name “tempura” at the forefront of them. Tempura = fried. So, if you’re trying to avoid extra carbs and fats that may not be as easy to track, stick to a starter with simple ingredients such as seaweed salad and edamame. *Pro-tip: Ordering sashimi is typically the best way to go, with lots of protein and little to no carbs (so you can save your carbs for a roll later). Many people tracking their macros tend to avoid eating sushi because of the carb count in the rice, but there are also plenty of hidden fats to look out for. If you're watching your fat intake, try opting for a roll that incorporates a low-fat fish. Bluefin tuna, or tuna in general, is higher in protein and lower in fat than other fish like salmon. If you’re worried about estimating and want to keep things as precise as possible, Adee recommends getting any sauces included in your roll on the side. Mayo-based sauces and eel sauce (which is high in sugar and sodium) are popular at sushi restaurants and often layered over the finished product of the roll. By asking for these on the side, you can dip them in individually and be precise with each piece and measurement. Craving more tips? 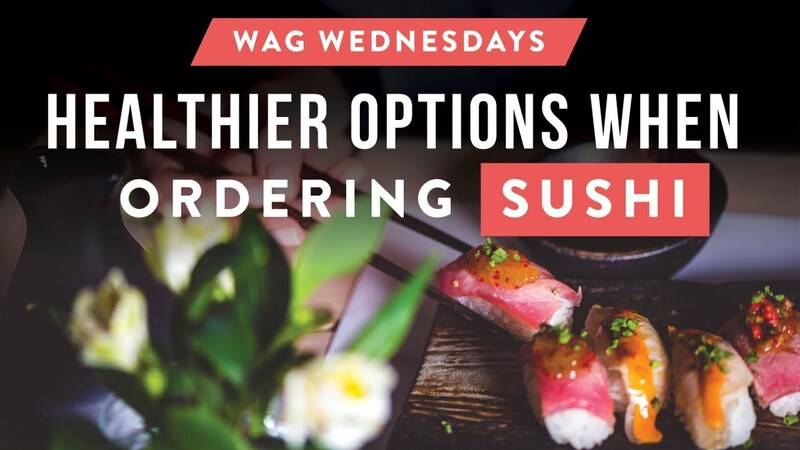 Download our pdf for on-the-go sushi tracking or get your own WAG coach to give you advice when dining out!